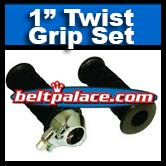 PowerTec Aftermarket Twist Grip Throttle Kit for Heald/Kimball Hauler. Left and Right Grip. Use with 1" dia. handlebars (some adhesive may be required).